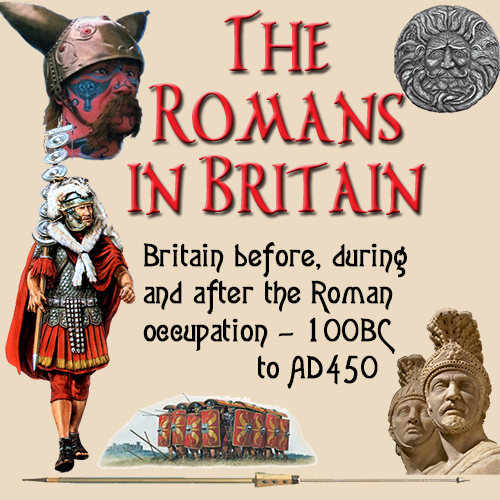 And so, having reformed the army in the manner of a king, Hadrian set out for Britain. There he corrected many faults and was the first to build a wall, 80 miles long, to separate the Romans from the barbarians. Apart from the roads, most people quote Hadrian's Wall as a Roman achievement and that is their extent of knowledge of the Romans. There was much more to Hadrian's Wall than a device to stop the Scots heading south, as we shall see. Prior to Hadrian, was Emperor Trajan who was a warlike leader intent on expanding the empire as fast as possible. When he was succeeded by Emperor Hadrian in 117AD., the whole attitude of the empire changed. Hadrian believed that the empire was large enough and extending the borders was not a practical option. The more the empire grew, the greater the need for the military to be deployed in far reaching areas. This meant having to recruit more soldiers, and so increasing the costs enormously. Many of the lands conquered were not populated as much as other regions, so the costs of keeping order were too great compared to the taxes and levies returned by the natives. 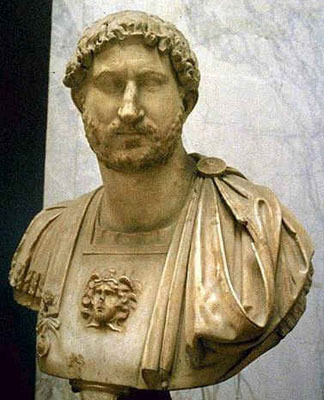 Hadrian embarked on a period of consolidation and reinforcement of the empire. Borders were strengthened. Legions were relocated and a period of clam began to emerge within the empire. He was a resourceful man who believed in using a means possible to secure the perimeters. One method he found useful was to move borders so that they ran along the banks of rivers and hilltops. this made them easier to defend and gave greater visibility of the enemy's territories. 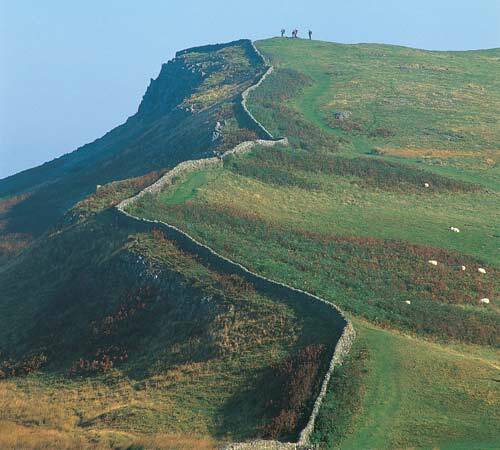 To fortify the position on the Caledonian border, Hadrian initiated the idea of a wall across the entire width of the country. The morale in this far reaching outpost of the empire was dismal. Soldiers were far away from home in a part of Britain that was cold, damp and dismal. Raids by Scottish tribes were common, and the soldiers felt lost and forgotten. they needed something to take their minds off the situation and to make them feel their presence in such a distant location was worthwhile. The idea of such a wall would make it the biggest and most impressive feat of engineering ever attempted by the Romans. The wall was designed to be 12ft (4m) high and 8ft (9m) wide over most of it's length. There would be places where the dimensions altered to permit the placing of gates that would allow controlled passage of people and traffic through the frontier. 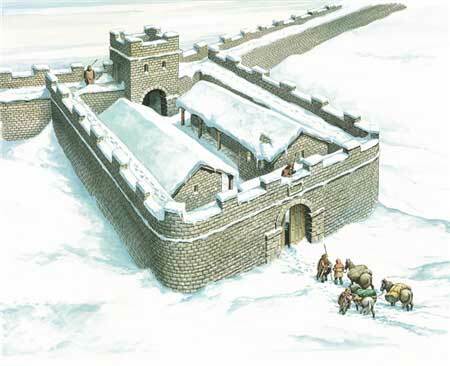 At strategic places along the length of the wall, forts were built, each housing between 500 and 1,000 legionaries. Built into the wall and spaced at one mile intervals were small forts known as 'milecastles'. Smaller still were the two turrets built into the wall between every milecastle, that enabled a soldier to look out over the contour of the landscape. These were used more as watch towers and staging posts than anything else. It has been found that it takes 2½ minutes to run from one turret to another. With a series of runners placed at each turret, a message could be transmitted in relays from one part of the wall to another in a relatively short time. Hadrian's engineers did not just rush in and build it without a great amount of preplanning. So it was not until 122AD. that construction of the wall actually started. The wall required a vast amount of material. It has been estimated that abut 3,700,000 tons (30,138,000,000 kgs) of stone was used. To undertake such a vast construction required massive amounts of labour. 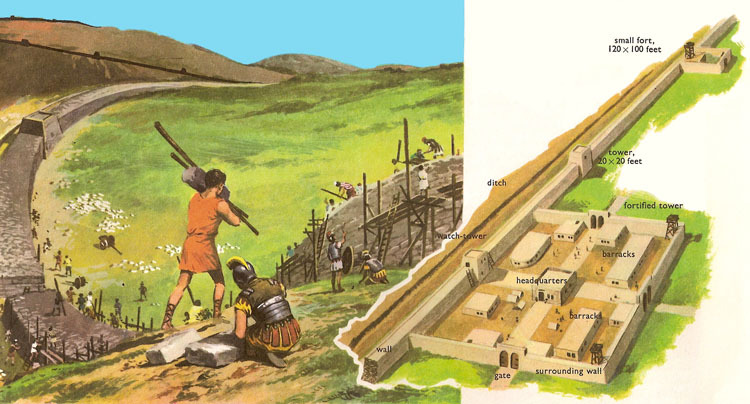 But the Romans, being sharp minded and inventive, developed a way of building that cut down on the amount of labour required and the time it would take to build the wall. The wall was a fantastic feat of engineering and construction with the stone and timber being shaped before moving it onto the site and placing it in it's allotted slot. Then came the clever bit. The Roman builders laid three rows of stones, staggering the layers as a modern day bricklayer does. A second set of rows was laid parallel with a gap between them. The space was then filled with a mixture of rubble, clay, cement, sand, lime and water. More layers were added and the gap filled in the same manner. This way of building meant there was less need to shape the stone, which ensured all pieces locked firmly in all directions. Little is known about the top part of the wall, other than it may have had a protected walkway and battlements so that anyone walking along the wall was protected to some degree, but could still see over the wall. The wall was then covered with a white lime mortar coating. This gave a certain amount of protection against the harsh weather, and also sent out a message that the Romans were here to stay. The wall was not the only defence. Ditches were dug on both sides of the wall. Those on the north may have employed the classic Roman style of ditch. This had sloping sides and a false bottom with sharp wooden stakes hidden below. The idea was that any invaders would come to the ditch and, on seeing the false bottom, would jump in intending to climb the far side. When they did leap into the ditch, the floor gave way impaling them on the stakes below. The southern ditch, (vallum), lies about 38ft (35m) away from the wall. both ditches had crossing points near a fort. This helped the Romans control who crossed the wall and made sure they paid their levies. The wall also had mounds near the ditches as extra protection. By the time the wall had been completed in 128AD, the area had been converted from a desolate sparse area into an 80 mile long community. The whole place was alive with military and those eager to get as much cash out of them as possible. Traders came from near, far and across the water to take advantage of this new opportunity. If there was a need, someone would supply it. Taverns, inns, blacksmiths handling both military and merchant needs were abundant. Fruit sellers, bakers, potters. If you can name it, there was a business there to supply the demand. The whole place was transformed in just three years from a bleak empty landscape into one of the most alive and thriving places in the Roman Empire. The wall had a very up and down history during it's use by the Romans. The main change in it's purpose came in 143AD when the Emperor Antoninus Pius began the construction of a wall further north. Parts of the ditches at Hadrian's Wall were filled in to make travel easier. As the new Antonine Wall began to operate and hold back the Scottish, so the need for the southern wall became less apparent. Many traders and businesses moved north to take advantage of this chance to expand their livelihoods. The steady abandonment of Hadrian's Wall carried on until the very early 160'sAD when the Antonine Wall was itself abandoned on the orders of the governor, Verus, and Hadrian's Wall again became the main northerly defence. So the traders moved south again, taking up their original positions. The situation stayed like this for only a short time. Verus could not have acted alone, and must have had the backing of the Roman senate for his actions. All the same Antoninus ordered the troops back to the Antonine Wall. Today archaeologists call this period "Antonine II". This did not last long and the Antonine wall was again abandoned in 163AD in favour of Hadrian's Wall. By now everyone in the area must have gone to bed at night not knowing where they would be the next day. The Romans did keep a presence north of Hadrian's Wall, until about 185AD when they lost forts at Birrens, Newstead, Risingham to the Caledonians. There are records that show repairs to the wall around 205AD, but little is know about the wall from then onwards. 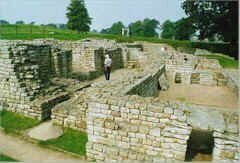 The wall was definitely in use in one way or another until the Romans left Britain in the early 5th century AD. After this, much of it was demolished by the invading tribes who used the stonework as foundations and walls in their homes. These techniques were copied from the Romans, using stone the Romans had supplied.